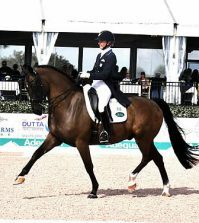 Aachen, Germany – The Dutta Corp. U.S. Dressage Team had solid performances throughout the Lambertz Nations Cup at CHIO Aachen. Led by Chef d’Equipe Robert Dover, the team of Katherine Bateson-Chandler, Shelly Francis, Arlene “Tuny” Page, and Steffen Peters garnered the Silver medal with a total score of 437.139. Saturday’s final placing also clinched the inaugural FEI Nations Cup™ series title for the U.S. Germany had a dominant performance in the eight-nation field, taking the top three places in the Grand Prix and Grand Prix Special and earning the Gold medal with a total of 492.598. Denmark finished with the Bronze medal on a total of 430.418. In Thursday’s CDIO5* Grand Prix, Peters (San Diego, Calif.) and Four Winds Farm’s Legolas 92 anchored the U.S. team with an excellent test, receiving a score of 77.324% from the Ground Jury of Maribel Alonso (MEX), Susanne Baarop (DEN), Stephen Clarke (GBR), Eduard de Wolff van Westerrode (NED), Peter Holler (GER), Thomas Lang (AUS), and Gary Rockwell (USA) to finish in fourth place. Francis (Loxahatchee, Fla.) and Patricia Stempel’s Doktor demonstrated their partnership with a steady test to score 72.200% for 12th place. Page (Wellington, Fla.) and her own Woodstock had a consistent test, marred only by a mistake in the two-tempi changes, scoring 68.971% to finish in 23rd place. Bateson-Chandler (Wellington, Fla.) was the first down centerline for the U.S. aboard Jane Clark’s Alcazar and had a solid test, aside from issues in the piaffe and collected walk, to post a score of 66.314% for 32d place. The U.S. Team put forth a determined effort in Saturday’s CDIO5* Grand Prix Special to earn the Silver medal. Peters and Legolas 92 were the final ride of the day and they did not disappoint with impressive piaffe and passage work and lovely canter half-passes. The Ground Jury of Maribel Alonso (MEX), Stephen Clarke (GBR), Eduard de Wolff van Westerrode (NED), Peter Holler (GER), and Gary Rockwell (USA) rewarded the pair with a score of 76.627% to put them in fourth place. Page and Woodstock had a much improved performance in the Grand Prix Special, producing an accurate and rhythmical test. They nailed their tempi-changes and demonstrated lovely passage work, scoring 71.451% to finish in 13th place. Francis and Doktor gave another consistent performance to help the U.S. Team. They demonstrated solid piaffes and executed brilliant passage work. 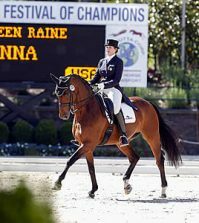 Francis and Doktor scored 70.647% to finish in 17th place. Bateson-Chandler withdrew Alcazar from the Grand Prix Special following a case of colic on Friday. The top 18 individuals, including Francis, Page, and Peters, will move forward to Sunday’s Grand Prix Freestyle. 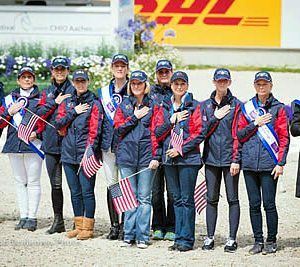 The U.S. is also being represented this week at CHIO Aachen in dressage, driving, and show jumping. On Thursday evening, the Hermès U.S. Show Jumping tied for the Silver medal with France in the Mercedes-Benz Nations Cup. On Saturday afternoon, the Land Rover U.S. Eventing Team finished in sixth place in the CICO3* Nations Cup. The U.S. Driving Team is in second place after the first phase, competition continues Saturday with the marathon phase, and concludes on Sunday with the cones. Find out more on USEFNetwork.com.